Today is the 22nd of December, the shortest day of the year, but for me the start of a long and scary road to recovery. I’ve been ill for several weeks now with a range of different diagnoses including appendicitis, chron’s syndrome, colitis, and more. On Friday (just on my way out to get a hair cut and go Xmas shopping with my Dad), I had a phone call from the hospital telling me that they’d like me to come in urgently due to a review of biopsy results. Not very good at smiling! Until this point, I’d been told by a number of people that being young and healthy, it’s not likely to be anything serious, that the risk of Cancer was low, and what ever it is will be treatable. Although not panicking at this stage, I was now beginning to think that it was something more serious. To help people in a similar position as me to understand the process and prepare themselves for this technically complex, whirlwind adventure that I’m about to face. To act as a diary of events for my own posterity and to help me keep my sanity. I hope that not only friends and family but others who are also affected by this condition can find something useful in this series, and if I’ve made a positive impact on one person, I have achieved my goal. As far as I can tell, for these kind of tumours, the symptoms generally present themselves as physical swelling. 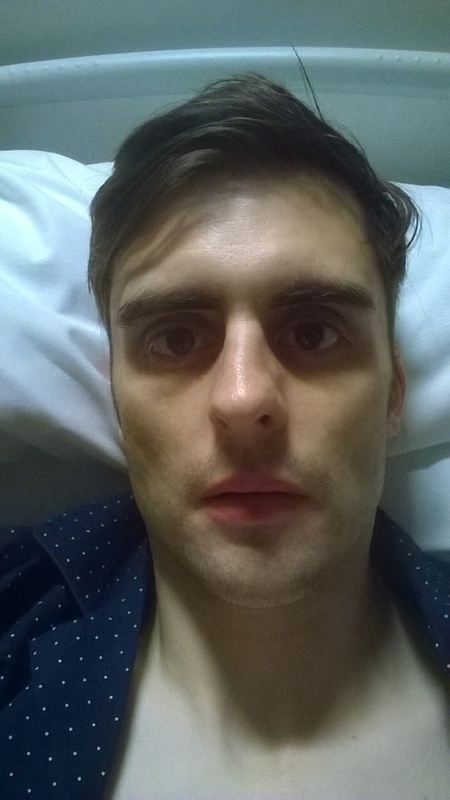 Due to the location of my tumour and the fast growing nature of it, it was restricting my bowel movements which meant that I was struggling to digest food, open my bowels and a general feeling of sickness. One strange symptom which occurred but only for a couple of days was night sweats. I initially thought I’d wet myself as the sheets and duvet were sodden. I then realised that I was dripping with sweat even though I was cold. Since having steroids, this symptom has gone. In my case (being fit and healthy) the diagnosis was a fairly slow process. I first saw the GP about the swelling, who suggestive it could be my appendix due to the location. I was then referred to a gastroenterologist who again felt my stomach and suggested that as I was in fairly good health otherwise and the pain was not too severe, it could be something like Chron’s disease. So he referred me for a CT scan so they could get a better look. While waiting for the CT scan, I became a little more unwell and pains, cramps and discomfort were getting more severe. I reached the point where I couldn’t eat any more and was being sick. At this point, I phoned 111 who sent me to an out of hours GP at 11:30 pm Friday 12th December. He decided to admit me to the hospital for safety. I spent about 5 days there where they kept me under observation and pulled my CT scan forward. The scan results were inconclusive especially noting that I had no visible signs in my blood tests, so they then performed a biopsy of the mass to determine it’s nature. By Wednesday I was feeling a little better and the pain had been brought under control using pain relief and eating a purée diet to help food pass through my system. They decided to send me home over Christmas so they could identify and plan my treatment over the break with a view to starting in the new year. The biopsy results came in on Friday 19th, and I was called into Worcester Royal Hospital which has a specialist oncology team who have been looking after me ever since. Thanks, and merry Christmas to you all too. We are all thinking of you and praying for recovery. Please do continue this blog of your experience. I think it will help many people better understand what you are going through as well as help us feel a bit closer even though we are on the other side of the world. Sending healing prayers and thoughts to you and support to your family. Rosie, Paul and the kids. Thanks Rosie, good to hear from you. Hope you all are having a great break. Thanks Dave, good to hear from you and appreciate the offer, please feel free to make corrections if I’ve missunderstood something- I’m finding the technicalities really interesting. I’m sorry that you’re going through this and I’m sending you best wishes. The blog is really interesting and you should definitely keep it up, I will be following with positive thoughts. Thanks Vicki, hope all is well with you. Sorry to hear the news Robin. All the blakes are behind you. Truly inspirational that you are doing this to benefit other people. I know your strong so keep fighting mate. Cheers Martin, glad to hear you’re ok.
Hi Robin, hope you’re keeping your spirits up, best wishes. Cheers Dave, my target is to be back on form ready for Pilton 2015! Well Robin I hope you get better soon. Sorry to hear about your current situation, I have no doubt that you will pull through. Cheers both, hope you had a good one, speak soon. Hi! Robin, Don’t know if you remember me? I’m Anne Hill who used to child-mind your younger brother Daniel. So sorry to hear about your illness, we (the hill family) are thinking of you and send our best love and wishes for a speedy recovery. Be strong and keep smiling! Hello Anne, thanks for your thoughts, regards, Robin.